Director Dmitri Tcherniakov's modern vision for the Canadian Opera Company's production of Don Giovanni opened on January 24th, presenting a challenging and innovative approach to the classic opera. We delve into some of the interesting discussion fueled by the show in our latest Storify. As if you needed another reason: we've listed the Top 10 reasons why you can't miss Don Giovanni, a new COC collaboration with some of our prestigious peers, including Festival d’Aix-en-Provence, Bolshoi Theatre, and Teatro Real Madrid. Musicians and music-lovers often refer to Don Giovanni as the “opera of operas.” Find out why by listening to excerpts from the stunning, genre-melding masterpiece in the Don Giovanni Listening Guide. 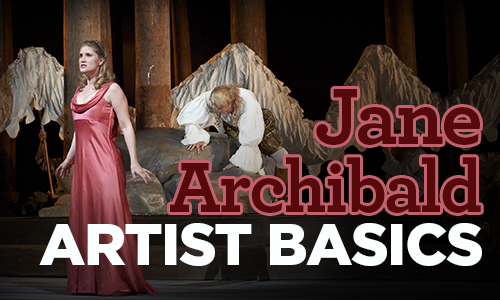 Jane Archibald makes a welcome return to the Canadian Opera Company stage! From her first role with the COC as Zerbinetta in Ariadne auf Naxos to playing the title role of 2012's Semele, this native Canadian seems to thrive on the new, the strong, and the individual.